Today I’m continuing work on the Landscape of Trust, an effort to better understand what trust means the people, how it is earned, how it is eroded, and how it impacts on the effectiveness of the organisation and its ability to engage individuals, to become fully Socially Dynamic. I’ve prototyped six questions so far and anticipate testing around 20 more to uncover the key features of this landscape and build upon my initial sketches. Today the question I present was exploring whether people have ever had conversations about trust within their organisation. I asked the question,”have you ever had an explicit conversation with your employer about trust?”. 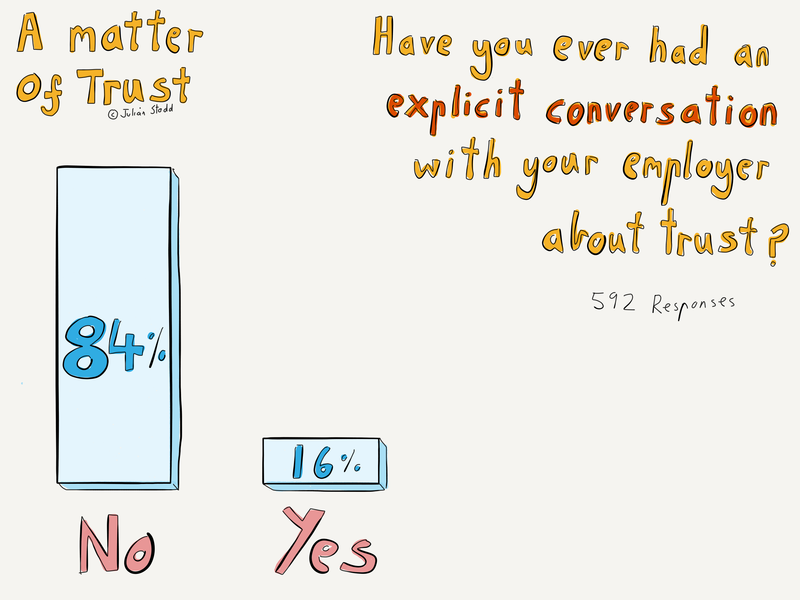 I have 592 responses to this survey and 16% of people said that they had had an explicit conversation about trust, whilst 84% said they had not. Whilst this is not a surprising result, I find it very interesting. Trust is clearly important, even if we do not yet have a precise definition or shared understanding, so it would seem useful if we are able to have explicit conversations about it at work. In the second phase of this survey work I will start to explore different sectors and my hypothesis is that we will see differences between, for example, military contexts, where I expect that the figures will be higher for those who have had that conversation, through to more commercial or retail environments where I suspect it almost never happens. From the first of the prototype questions we saw that 54% of people have low or no trust in the organisation that they work for, and in one of the later questions we saw that when people have low or no trust they may leave, but more significantly are much less likely to engage, to help others, or to share. 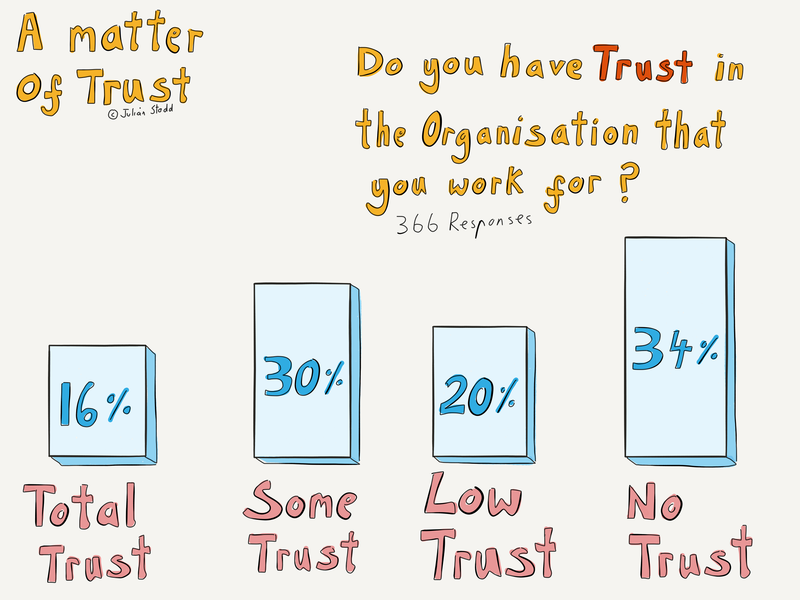 For that reason alone it seems as though organisations should consider shining a spotlight upon the question of trust. I have a nagging suspicion that the subject of trust is rarely discussed in an organisational context out of the great fear that we know it is lacking, possibly compounded by a sense the trust is to soft a concept to discuss. In our social lives we have a native understanding of trust, often hard earned through early relationships. We understand how trusts is earned and must be reciprocated, and we understand the things that we do which erode or break it. And yet we rarely ask directly,’do you trust me?’, in less we are seeking an explicit validation before embarking on a risky action. It is unlikely that any organisation is going to sit an employee down and ask them the question. It would seem somehow inappropriate, somehow as if they were pleading for trust, maybe even somewhat desperate. And yet trust is important: if we have no way of measuring it or gauging it, if we pay no attention to it in any structured way then we are simply held hostage to the ways that it emerges. Indeed I expect that this is largely how it plays out today. 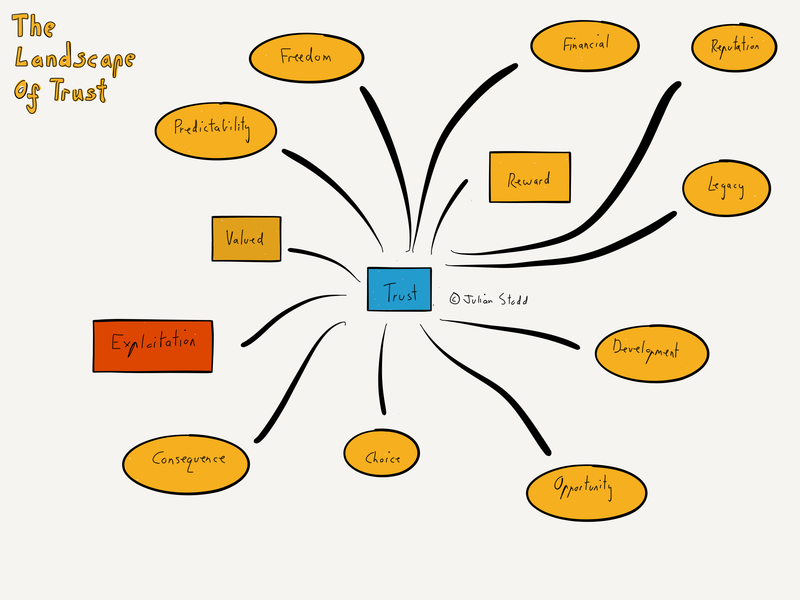 Trust is clearly a multivariate notion: in parallel to developing the Landscape of Trust, I am exploring ideas around the taxonomy of trust. I think the landscape will chart the different areas, the components, and try to understand what relates to what, for example what is the relationship between trust, reward, freedom, and so on, but also how strongly is trust influenced by each one, and how is it experienced overall. The next of these prototype questions that I will write up looks explicitly at blind trust, trust which is invested despite all logic and reason. I suspect we will end up with a taxonomy covering four levels of trust: no trust, functional trust, invested trust, and blind trust. My reasoning is this: having no trust is a bad thing, but blind trust, invested without question or reason, may be equally bad. I’ve defined functional trust is something like the expectation that you will be paid at the end of the month: we need functional trust, but is nothing to get too excited about. I think functional trust is something that can probably be demanded, and would certainly be the bare minimum for engagement, at least in populations where there is some choice. I suspect in some contexts engagement can happen without functional trust, but primarily because there is a lack of other options, in other words when people are desperate and lack choices they can be engaged without the organisation making any investment in trust whatsoever. I need to define invested trust further, but broadly it’s the discretionary trust which is burned, and it’s the trust which has the greatest value. To be Socially Dynamic, the organisation must surely have invested trust, but may need to be wary of tipping over into blind trust. It’s an area I’m going to explore, but my sense is that blind trust may reduce our desire or ability to question, challenge, and even support. So getting a sense of how this will play out, populate the landscape of trust, to understand the different features within this highly subjective notion, and to understand the interrelationship between them in different contexts and environments, and build out the taxonomy of trust, to understand how trust is experienced in these different spaces and how much of the good types of trust we have, versus the ones that make us less dynamic. If we can achieve this, I believe that it will form a useful framework for exploring trust in organisational contexts, not with a view to scoring it, but with a view to understanding, providing a baseline, of how one organisation measures up against others, and providing clear direction for the areas of focus that may lead to earning greater trust, specifically greater invested trust, the type that we need most. I will continue to #WorkOutLoud as I develop these ideas. This entry was posted in Trust and tagged Friendship, Leadership, research, Social Contract, Social Leadership, Trust. Bookmark the permalink. Excellent point of view. How the workers see the company they work for it is the most important, because, they, more than any other, know how it is working and the impressions that they have about what they do.